A Beach themed wedding is beautiful as they feel so romantic and the great thing about this theme is that it doesn't have to cost a fortune to create a stunning centerpiece. 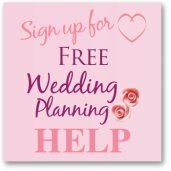 You could hire a florist or wedding decorator but you would be wasting your money as these ideas are very simple! Just think of all the free beach items that you could use, and then replace afterwards. Pebbles, shells, driftwood and sea glass are all items that would easily be added into a centerpiece. A nice easy beach idea is to use hurricane lamps, these you can pick up cheaply at consignment stores, thrift stores, wholesalers and don't forget to ask friends and family if they know someone that was married recently - they may just have a basement full of hurricane lamps! 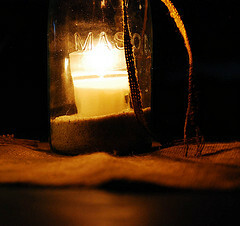 With the hurricane lamps you can half fill with sand and pebbles and then have a pillar candle. 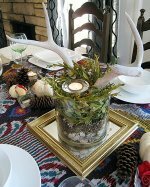 You could also use shells and you can pick these up quite cheaply in craft stores - put a few shells in each centerpiece and you will find that one bag will go a long way. Rather than buying hurricane lamps you could use large glass jars, check out the jars at your local supermarket and then ask your friends and family if they do buy that product could you have the empty jar! You can keep the jar simple by tying twine to the top - they will be just like the jars kids use for collecting their finds from the rock pools. Fill the jars the same as with the lamps. You can pretty the jars by using ribbon that matches with your wedding colors. These Mason Jars would look wonderful as part of your beach themed centerpiece and are available from Luna Bazaar. 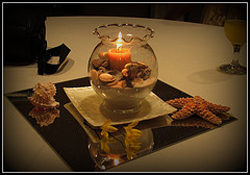 Floating candles also work well with shells and pebbles at the base of the bowl. One friend's wedding had pebbles from the beach where they were married. Small tin pail buckets can also be used as your centerpiece, you could fill them with candy, favors, tie balloons to the handles or you could fill with sand and have a candle and shells to decorate. Pebbles are a good base in a vase before you either put the flowers or floating candles. You could do soemthing like this example and have flowers above the vase and if you wanted to add more light with candles you could have tealights dotted around the table. 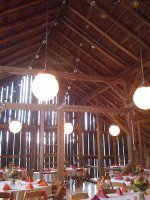 If you are having a more rustic look to your wedding decorations you could look at drift wood as the main part of your beach themed wedding centerpiece. This works really well if you live close to the beach as you can keep yor eye out for great shapes with the drift wood. Decorate the drift wood very simply with candles or sparkly fairy lights. If you are looking for more fun ideas you could have a wooden boat as your centerpiece, filled with the favors, or any number of children's beach toys as a fun focal point. The key when you are creating your beach theme is to keep the colors simple; pale lemons, blues, greens, pinks, and creams work really well. 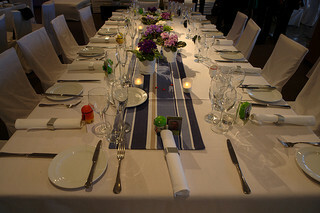 Love the blue strip table runner in this picture as it reminds me of the old fashioned deck chairs. And the colors are perfect for a beach theme. You can always use your beach wedding favors as your beach themed wedding centerpiece. The favors may seem expensive for favors but when you think they are providing the decoration as well, then you are not spending anything on your centerpieces. In the end you will be making a saving. 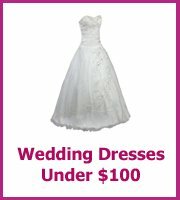 Here are some great beach favors from My Wedding Favors that would work really well as the table decorations. You could always scatter some shells and pebbles on the tables if you felt that you needed a bit more.